Jack Blaney dominates the middle of the park for Saints. Pic by Blair Smith. Both teams started quickly but it was Saints who looked more likely to net the opening goal. Falconer got a shot away on six minutes but it sailed wide before Another shot was saved and punched away by Klijsen. 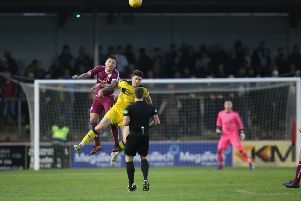 Penman then had a header rebound off the bar before, two minutes later, Michael Fleming had a go but his effort went just wide. A chip by King gave Falconer a chance on 14 minutes but his header was straight at Klijsen. Another save by him three minutes later saw him tip it wide and away. Just after the half hour Saints finally got the breakthrough when the home defence were unlucky to have a penalty given against them. McInnes hit it well and placed it just wide of the keeper’s left. Four mins later a free kick by Stirling was fired straight at Wilson and held easily. McInnes had another effort on 42 minutes but Klijsen palmed it away at the post. Just before half time the home team were caught out when a good chip forward was met by Stark on the run and he made ground into the area to fire a well hit shot past the keeper for Saints to go two up at break. Stirling started the second half with the intent to take game to Saints but they more than coped and continually broke through the home defence. Falconer had a header off a corner on 54 minutes but it ended just over the bar. Two minutes later Jack Wilson headed well but it went narrowly wide. Oliver Fleming got a third for Saints when he headed home from a well hit free kick with around 20 minutes to go. With 10 minutes to go Cunningham headed home for a fourth. Wilson then got on the end of a cut back to calmly slot it past Klijsen for 5-0. During the last 10 minutes Stirling Uni were reduced to 10 men when Baber was sent off. This weekend Saints have Ormiston at home.